You are invited to join my on Thursday 28th September between 1pm and 3pm for an In My Pocket Twitter Party. We have just received our party box containing lots of Puppy and Kitty In My Pocket collections. We will be sharing photos over on Twitter during the party of the collection. Our party box contains some fantastic goody bags for all our guests, including some blind bags and the girls have asked to do a blind bag opening video which we will share very shortly. There are some fantastic games to play, colouring in sheets and word searches to complete. 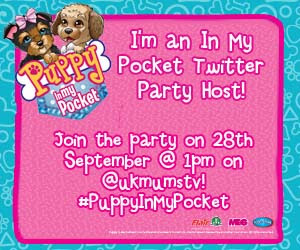 Over on twitter there will be a host of prizes to be won so make sure you are following myself and @ukmumstv !